The Aura can be fortified, Strengthened, expanded and you can also let it bright purifying ... like a Glass. Your Glass. Evil person ... try ... and many times can succeed to pierce Your Aura ... This does not means you will succeed always but ... just Try. After all your Soul is Immortal and with enough Light your Body can become too. These lessons are not Earthly ... in the sense dictated by Earthly persons but Heavenly ... in this case by Lord Koot Hoomi, who was Pythagoras and Saint Francis. World Religions today do not accept or explain or support Re-incarnation or Re-imbodiment. In the case they do ... they do not display the entire Path of "Visits" of the Soul ... how many times, where and what did ... explaining who was the person. At last ... their Time cycle where they lived ... Egypt, Greece, Italy but they are also Ascended ... or "One with the Lord" ... in High Dimensions of High Consciousness ... High Time. Is sad to say ... that with all Lives of many thousand Saints ... with all the Books ... The Bible, The Tao, The Bhagavad Gita, the Quran, the Confucius Anaclets, The Vedas ... The Discourses of the Buddha, and many others ... people are afraid by Dark and few Dark ones with their eternal Evil Intentions to "Divide and Conquer". Say, "No ... to them"
1 Some men upon the planet are little aware of the need for protection to the consciousness, nor are they aware of the possibility of others creating a barrage of negative energy calculated to disturb the equilibrium of their life-streams. Let us set the record straight. 2 There are many who are at various stages of mastering the control of negative energy and manipulating their fellowmen by a wide range of tactics and techniques. 3 There are also spiritual devotees of varying degrees of advancement who are in the process of mastering the godly control of energy and who understand somewhat the Brotherhood's systems of protection and the countermeasures they can take in defense of their own life plan. 4 A God-endeavor indeed! Upon this earth, heaven needs many who can work the handiwork of God. 5 If a planet is to fulfill its destiny, it must have those who can work in the light of God that never fails, unhampered by the forces of antichrist that would, if they could, tear down every noble endeavor of the sons and daughters of God. 6 From time to time these are and will be viciously assaulted through psychic means whereby the garments of their individual auras are sometimes penetrated and even rent, unless they are spiritually fortified. 7 Yet that blessed aura, when it is properly intensified and solidified with light, becomes the shield of God against the intrusion of all negative energy, automatically and wondrously repelling those arrows that fly from the dark domain, (Ps 91:5) seeking to penetrate the peace of God that abides within, hence destroying peace. 8 Let me remind all of the natural envelope of invulnerability that serves as the protection of every man against those arrows of outrageous fortune (Hamlet, To be or not to Be) that fly so loosely in the very atmosphere of the planet betwixt men. 9 However, through extraordinary measures the forces of darkness are often able to engage men in some form of argument whereby through inharmony they momentarily forfeit their protection. 10 This is the game they play to catch men with their guard down. Then again, they launch such an attack of viciousness as to cause them, through fear, to open up their worlds to discordant energies, which results in the rending of their garments. 11 Earlier in the series I gave an exercise for the strengthening of the aura through the development of the consciousness of invulnerability. 12 Now I would make plain that in addition to spiritual fortitude one must also have spiritual reserves—what could almost be called reserve batteries of cosmic energy. 13 The storing-up of God's light within the aura through communion with the Lord of hosts and through invocation and prayer, plus the sustaining of the consciousness in close contact with the angels, with the tiny builders of form acting under divine direction, and with all who are friends of light, creates an alliance with the forces of heaven. 14 Through contact with each devotee's aura, these veritable powers of light can then precipitate the necessary spiritual fortifications that will give him a more than ordinary protection in moments of need. 15 Let the student understand that his protection is threefold. 16 First of all, he enjoys, by the grace of God, the natural immunity of the soul, which he must not forfeit through anger or psychic entrapment. 17 Then there is the assistance of the angelic hosts and cosmic beings with whom he has allied himself and his forcefield through invocation and prayer. 18 And last, but certainly not least, there is the opportunity to request of his own Presence (I AM Presence, Higher-Self) the continuation of godly defense through an intensification of the tube of light that will also establish in his aura the needed protective strata of energy which create a protective concept that cannot be penetrated. 19 Bear in mind that sometimes the best defense of man's being is a necessary offense. 20 And when you find that it becomes necessary to momentarily engage your energies in this way, try to think of what the Master would do, and do not allow your feelings to become negative or troubled by your contact with human discord of any kind. 22 Remember always the goal-fitting that is required of those who would remain on the path. 23 You did not begin upon the path in order to become involved in strife. 24 You began in order to find your way back home and to once again hold those beautiful thoughts of celestial fortitude and cosmic intelligence that would create in you the spirit of the abundant life. 26 Freely you have received and freely you must give,(Matt 10:8) for the heart of each man can gather quantities without measure of this infinite love in its superabundant onrushing. 27 There is an erroneous thought in man that I must decry. 28 It is the idea that man can get too much of spirituality. 29 Oh, how fragile is the real thought of truth about this subject, and how easily it is shattered by human density and the misappropriation of energy. 30 Man can never secure too much of God if he will only keep pace with him—with his light, with his consciousness, with his love. It is up to each one to do so, for no one can run the eternal race (Heb 12:1) for you. 31 You must pass through the portals alone; you must be strengthened by your own effort. 32 And you must also face the dragons of defeat and darkness that you once allowed free rein in your own arena of thought and feeling. 33 Slay these you must by the sword of spiritual discrimination, thus building an aura of use to the Masters of the Great White Brotherhood. 34 Of what use is an electrode? Like the hard tip of a penetrating arrow flying through the air, an electrode becomes a point of release of giant energies that leap forth to conquer. 35 And there are many things that need to be conquered. 36 Above all, there are within oneself conditions of thought and sensitivities of feeling that require man's dominion. 37 The man of whom I speak is the heavenly man— the man who abideth forever, one with God as a majority of good. 38 His heart must not be troubled. And the injunction of the Master "Let not your heart be troubled" ((John 14:1) must be heeded. 39 For the aura is a beautiful electrode that can become of great use to heaven, and it must be consciously strengthened if man is to truly realize his potential. 40 Won't you understand with me the need to be the shield of God, to remain unmoved regardless of what conditions or difficulties you may face? 41 For it is the power of heaven that liveth in you to strengthen the emanation of light from your being, both from the within to the without and from the without to the within. 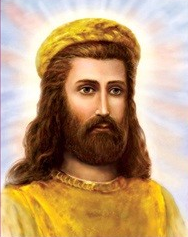 42 You can receive, both from without and from within, of the strengthening light that maketh man truly aware that he can be, in his aura and in his very being of beings, a shield of God—impenetrable, indomitable, and victorious. 43 I remain firm in the love of the purpose of your being.